It was a mild winter day so I took advantage of the situation and headed out with my miniatures. I’ve just added a Food Truck to the mix since they seem to be the latest craze and are popping up here in Eau Claire, Wisconsin. I set up in Phoenix Park which is located at the confluence of the Eau Claire and Chippewa Rivers in Downtown Eau Claire. Tonight the 44th Holiday Concert presented by the Department of Music and Theater Arts and The UW-Eau Claire Foundation, Inc. was being held at the new Pablo Center at the Confluence. 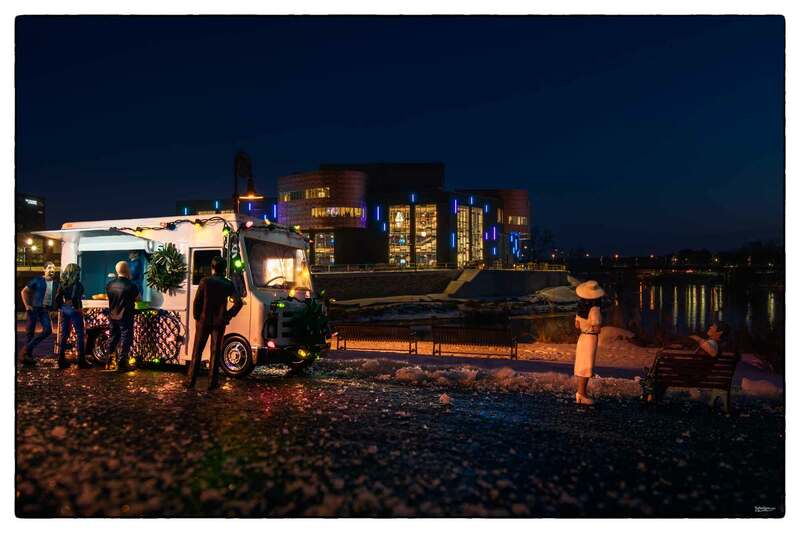 I used the lights from the Pablo Center as my backdrop and my daughter Jan added some miniature Christmas Tree Lights to my food truck. I then did some light painting techniques to balance the light for the other elements in this image. Critiques always welcome! Thank you for stopping by my TheSideStreet.com blog. Feel free to share this image with a friend if you’d like! You can see more of these types of images in my “Miniatures Gallery” on my website.